Not that long ago, most Americans believed that infectious diseases were a threat from the past, subdued by vaccines, improved sanitation and the momentous discovery of antibiotics. Unfortunately, the situation is not quite that rosy. The appearance of HIV, virulent influenza and more recently the Ebola scare have made us all pay attention to communicable diseases again. The four San Antonio women featured in this article are on the forefront of the battle against virulent pathogens, two as physicians dealing with patients and epidemiological aspects of the battle, and two as research scientists discovering the root mechanisms of infection and immunological approaches to protection. “There’s always something new every year,” says Dr. Jan Patterson, an infectious diseases physician and director of the Center for Patient Safety and Health Policy at the Health Science Center, where she is also a professor. “Influenza is an annual threat, even though we tend not to get too excited about it,” she says. “The H1N1 virus in 2013 was quite deadly. Many young adults died. Oddly, older adults showed a greater resistance, probably because they had had more exposure to the various flu strains over their lifetime. A new illness, SARS (severe acute respiratory syndrome) was first identified in 2003 when it sickened thousands in various parts of the world, including Canada. There is also the return of vaccine-preventable diseases such as measles and pertussis (whooping cough), which adults may have without being very sick, but if they pass it on to children, it can be dangerous.” Pneumonia is also fairly common, and even tuberculosis still exists. And though AIDS can be controlled by drugs, it remains a serious illness. But what worries Dr. Patterson and other specialists in the field most are the antibiotic-resistant infections, of which there are two types, referred to as gram-positive and gram-negative. Two challenging infections in the first group are the highly virulent C. Difficile – or C.Diff. — which usually emerges in hospital settings, and MRSA (methicillin-resistant Staphylococcus aureus), which can show up both in the community and in health care facilities. In the latter case, it may cause life-threatening blood infections. The best-known gram-negative bacterium is probably E-coli, though there are others with unwieldy names. Among Dr. Patterson’s current patients at University Hospital are individuals with a range of infections, including MRSA. 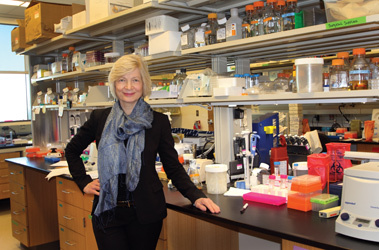 She and her team have been part of the broader national effort to test new treatments for the multi-drug-resistant pathogens that show promise against the gram-positive infections. Unfortunately, there’s little progress in the fight against the gram-negative microbes. Not that many new antibiotics are being discovered, explains the doctor, because the pharmaceutical companies have little incentive to invest in their development. The cost of developing and testing a new drug is very high, and antibiotics have a relatively limited use. While blood pressure or AIDS medications must be used every day by patients with these conditions, the germ-fighting drugs are normally taken for a number of days only, until the infection clears up. Indeed, she’s helping many people both through direct care of sick patients and with her interest in identifying best methods to improve patient safety and overall hospital care. Ultimately, the best treatment is prevention. Her expertise in both aspects of infection control has been sought at many levels. She is the chairwoman of the Texas Infectious Disease Readiness group formed to educate professionals and the public about Ebola and other contagious diseases and has recently been chosen to serve as an adviser in infection control for the Centers for Disease Control and Prevention. Dr. Patterson believes that San Antonio is well prepared to handle major crises, including a medical one, thanks to the work of the Southwest Texas Regional Advisory Council that develops and maintains an emergency response system for the city and 22 counties in the area. Jean Patterson has always known that she wanted to be a scientist. When she was in third grade, her parents presented her with her first microscope, an instrument that has been a part of her life ever since. 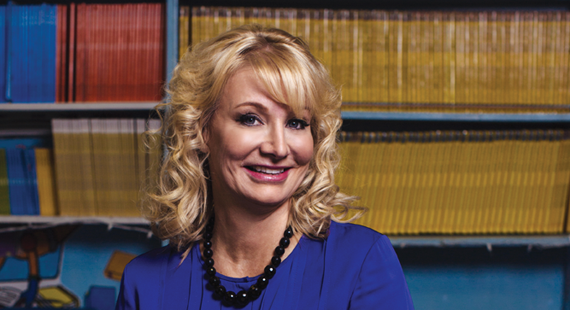 Today, Dr. Patterson is the chair of the virology and immunology department at Texas Biomedical Research Institute, where she conducts and supervises breakthrough research in the field of vaccine and anti-viral drug development. The building in question is no ordinary office building. Since the scientists work with virulent pathogens, the hands-on experiments must be performed inside special biosafety labs following strict safety procedures. Texas Biomed has a number of those laboratories, including a BSL-4 lab, which is the highest safety level designation. It’s the only privately owned BSL-4 facility in the U.S.
Dr. Patterson was researching potential antidotes for anthrax for a while when the infamous anthrax attacks happened in 2001, just a short time after the nation was badly shaken by the 9/11 events. Looking for the culprit, the FBI made a visit to her department, but “fortunately we did not have the anthrax strains that were in those envelopes,” she recalls. However, these events led the government to focus on developing countermeasures to potential biological weapon attacks, and her department has been playing an important role in that plan ever since. In collaboration with a couple of other institutions, she and her team have so far developed three viable vaccines against Ebola and two vaccines against Lassa fever, both serious illnesses that cause hemorrhagic fever and infect and kill thousands of people in Africa. “Five people were killed by anthrax, and that is the reason that today we are close to having an Ebola vaccine,” says the scientist. Pre-tested in healthy volunteers in the U.S. and the U.K., the vaccines are now undergoing clinical trials in West Africa, where Ebola is still active. Dr. Patterson points out that there are six different strains of the Ebola virus and that her vaccines were not specifically designed for the current strain in Africa, but they still may work. “We are hoping to find a single vaccine that would work against all strains,” she says, and that may actually happen this year. Work on yet another vaccine, called the Marburg vaccine, is also in progress. But vaccines are only half of the battle. The other part is the development of anti-viral drugs to use once an epidemic starts. Dr. Patterson confides that such a drug will be announced in the very near future – “a major splash!” — but won’t tell us what it is before the official unveiling. She’s clearly excited about it. In both cases, the painstaking work involves studying how viruses replicate and multiply, how the immune system reacts to a virus and how to stimulate the immune response to fight the attacker without destroying the organism. Before anything can be used in humans, there’s a long road of testing on mice and eventually on nonhuman primates such as the small marmoset for which her department has developed a testing protocol. The latter is a crucial step. “We cure a lot of mice of cancer and Ebola, but often those treatments fail in primates,” she explains. We take a break from our conversation to look at the BSL-4 lab via cameras that allow her to monitor the lab activity from the outside, and I ask her about the number of women in her field. Quite a few earn a Ph.D., she says, but a good number drop out after age 35 when the demands of having a family and pursuing academic research overwhelm them. Few women professors at Harvard were even married, she adds. Though she has no kids of her own, Dr. Patterson is married to James Drewry, an engineer whose firm designed the virology building, and a father of three children, now grown. Even without little ones at home, it may be stressful for a high-level scientist like herself to juggle home and work responsibilities, which, in her case, involve a lot of travel. The list of national and regional committees, panels and advisory boards that she is on is a page long, but she singles out two that are particularly important to her: the National Scientific Advisory Board for Biosecurity, appointed by the U.S. Secretary of Health and Human Services; and the External Advisory Committee New Mexico-Imbre that guides the NIH-funded science program for faculty and students at the small college. Research scientists face challenges few other professionals do, given that their business is to discover the unknown. But the rewards are unique as well. Asked what the highlights of her career are, Dr. Patterson is more than happy to reflect on that subject. She experienced the thrill of discovery at least three times, first when she figured out how a virus starts a replicating cycle, the second time when she discovered a family of new viruses never identified before, and finally “the first time we proved that the Ebola vaccine worked. “There’s nothing like looking at a result (of experiments) and realizing no one else in the world knows about this but me,” she says. What Dr. Heather Yun likes about the infectious diseases specialty is that “you get to be the consummate physician” who treats the whole human being and deals with his/her whole story. 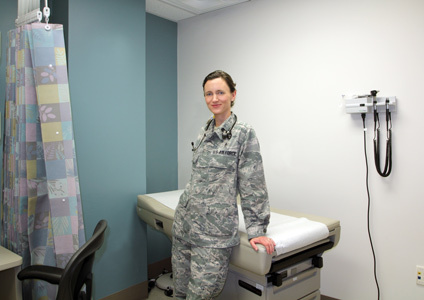 As an Air Force lieutenant colonel and doctor, Yun works at the San Antonio Military Medical Center or SAMMC (formerly Brooke Army Medical Center) treating patients both in hospital and clinical settings who may have tuberculosis, AIDS, pneumonia or complicated multidrug-resistant infections that require special vigilance. But a big part of her duties is also to help educate military personnel who are being deployed to various locations around the globe. In fact, the morning of our interview she had to teach a National Guard unit going to West Africa how to take care of themselves to avoid catching malaria, dengue fever, diarrhea or yellow fever. This group was not headed to Ebola-infected lands, but an earlier unit was and “that was a different conversation,” says the doctor. She also oversees post-doctoral fellows who are going through the final phase of their medical training. Wound infection is of special concern to her and other military doctors. At present, Dr. Yun is conducting a study in this area with the San Antonio-based company Xenex, which makes a promising disinfecting robot device based on ultraviolet light. (See Guys to Know in this issue). SAMMC is well known for its treatment of burn victims, who are exceptionally susceptible to infection. “We are interested to see if the Xenex device will reduce infection in this high-risk population,” she says. 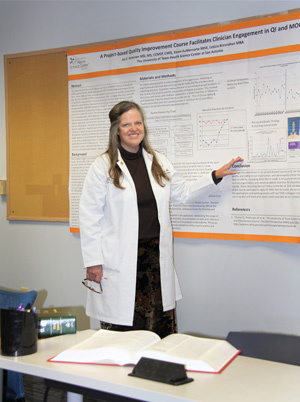 Her other research projects have included a study of conditions under which multi-drug-resistant diseases develop in combat casualties and an examination of occupational exposures of health care personnel in a deployed environment. Deployment can be hard on a mother of three young children like herself, but between her supportive husband, Ted Yun, and hired nannies, she managed to leave without too much anxiety. And her children are proud of their mommy. When she goes to their schools, she’s treated almost like a celebrity. And she is definitely a role model. “My daughter recently said to me, ‘You can’t leave the Air Force because I want to become a doctor and work with you when I grow up,’” relates the doctor with a big smile. This tough mom has an artistic side, however. 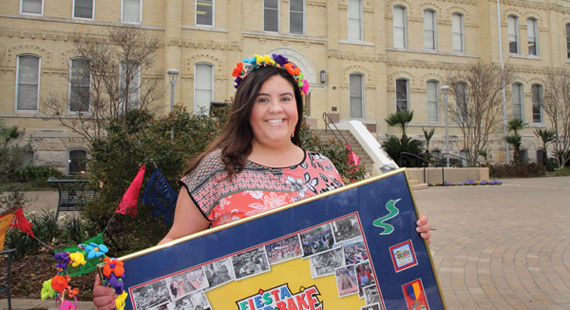 In her spare time she sings with the San Antonio Choral Society and plays the guitar and piano. Would she recommend this career to young women? we ask. As she was finishing her Ph.D. in human genetics at Columbia University, Dr. Ruth Ruprecht received an unexpected piece of advice from her mentor, Dr. Sol Spiegelman. “Now you should go to medical school,” he told her matter-of-factly. “You are good, but you are only a woman, and you speak funny, so nobody is going to listen to you (her native tongue is German, and her English was not very good). If you go to medical school, the Ph.D.’s will listen to you because you have an M.D., and the M.D.’s will listen to you because you have a Ph.D.” This was in the 1970s, when few women reached the upper echelons of scientific research. The Swiss-born young woman mulled it over for a while, then proceeded to do as the professor advised. It was during her internal medicine residency at UCLA that she first noticed “all these young men coming into the hospital with a strange infection that they later died from.” Those were, of course, the early AIDS victims, but back then no one knew anything about this disease. Life went on, she married, moved back East, had two sons, and eventually joined the prestigious Dana-Farber Cancer Institute of the Harvard Medical School, where she would stay for 29 years. The scientist’s focus later shifted to the development and testing of vaccines. In the summer of 2013, Dr. Ruprecht and her entire lab team moved to San Antonio, where they now continue their research at the Texas Biomedical Research Institute. The new phase of the work requires testing on primates, our closest biological cousins, and TX Biomed has an established primate research center. “Here, we have the opportunity to work closely with veterinarians and get fresh samples of tissues and cells to analyze,” says the doctor. Also making the trip from Boston was a white office board that’s prominently displayed in her current office. Half of the board is for science doodling, while the other half features a soccer game as drawn by her son Adam when he was 7 years old. No one is allowed to erase the drawing that the proud mama enjoys showing to visitors, down to pointing out the details the young artist included. Long divorced, she reared her boys as a single mother. NextMargaret Jabour: In the Business of Celebrating Life! Defining Civility Today: Have texting, cell phones and Facebook changed the old rules?